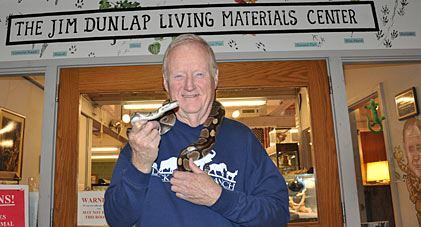 Jim Dunlap spent more than 34 years teaching in the Plano school district and was awarded the Texas Animal Control Association Humane Educator of the Year Award in 1993 and 2008. He is best known as the biology teacher who outgrew his classroom at Plano Senior High School after collecting so many animals that the school district relocated him to the new Holifield Center, which opened in 1989. Jim and his beloved python "Katy" are legendary in Plano schools. His love of teaching people about reptiles and other animals began when he was a boy on his school playground in Mesquite, Texas. "Hold up a lizard, and you get a crowd quickly," he said. His box turtle collection grew to 52 by the time he was 10 years old. His mother said that he could have any animals he wanted as long as they didn't enter the house, so his father built a shed in the family's backyard, and Jim's teaching days began. Later, when Jim was in the Army and stationed in Germany, he ended up coaching little league baseball for the American Youth Association. Teaching was always his favorite activity. "My granddad always said, 'You can't teach anything unless you have their attention. '," Jim recalled. Since his first year as a biology teacher at Plano Senior High School in the 1970's, he's had no problem keeping the attention of students young and old by sharing his passion and knowledge of biology. "The word biology means the study of life," noted Jim. "So, I've always enjoyed sharing living things to teach students about nature and the environment." Jim was well-known by many animal care and control agencies because of his willingness to help with wild and exotic animals. Over the years, he helped Animal Control Officer capture, transport, and care for tigers, bobcats, monkeys, snakes, lizards, and a variety of other animals. After his retirement in 2010, PISD renamed the center he helped build to the Jim Dunlap Living Materials Center and TACA named the Humane Educator of the Year Award after him to honor his legacy of teaching respect for all animals and for always being willing to assist animal control agencies with some of the more unusual calls they handled. Jim passed away on April 5, 2015, but his love of all animals will live on in the tens of thousands of children he helped teach over the years. The Jim Dunlap Humane Educator Award is given every year to recognize outstanding agencies and people in the animal care and control profession who promote humane education to the children and adults in their own community or in the state. Recipients of this award can be re-nominated for further contributions after a five year period has lapsed.